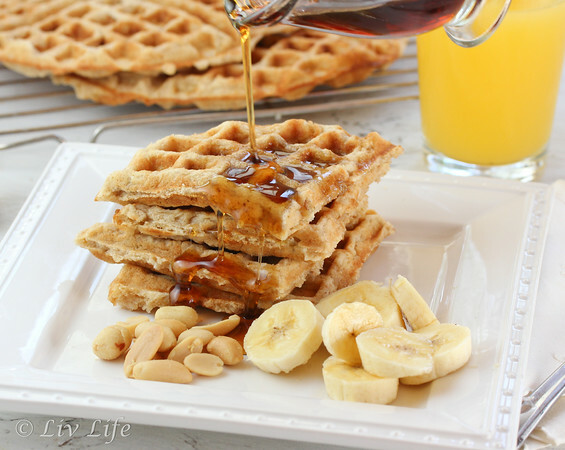 As I rose before the kids, I hoped their first early morning of the school year was eased ever so slightly with aromas of freshly baked waffles wafting throughout the house. Up at the break of dawn, I had the flour mixed, eggs lightly beaten, and the waffle iron hot before the full sunrise. 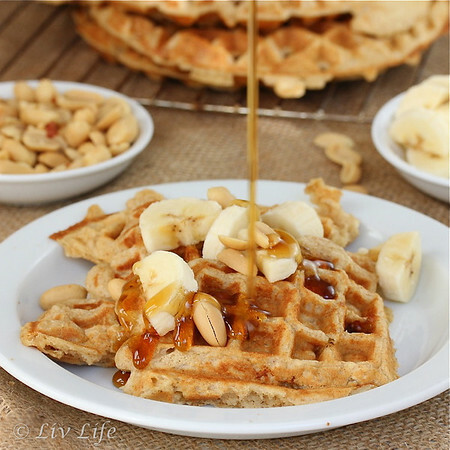 A touch of peanut butter in the batter proved somewhat controversial in prior discussions, however that same touch also proved to be an extraordinarily welcomed addition on this early first day of school morning. Now left with empty plates and syrup drips on the table, I find myself alone in the house for the first time in months. I've been looking forward to this day, but now that it's here, I find myself somewhat lonely, and even a little emotional. 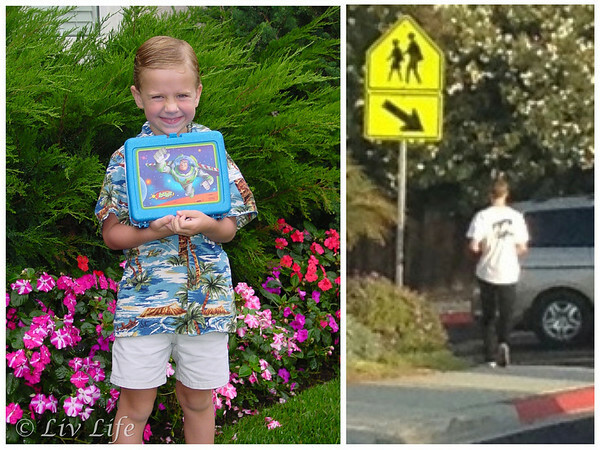 It seems only yesterday that I sent my little 5 year old boy off to kindergarten and watched in amazement as a few of the veteran moms simply popped their kids out of the the car, driving off with errands on their minds as I stood rooted to the playground grass watching my son keep his eye on me while he played. As the bell rang the teacher mentioned it was time for parents to go. A look of fear passed over my son's face as he decided whether to run to me or follow the other kids to the line. He did go to the line but the tears welling up in his eyes brought tears to my own, tears which flowed again 4 hours later as he sprinted from the classroom and leaped into my open, waiting arms. Burying his head into my shoulder he cried how he had missed me, and I responded in like fashion. A similar scenario followed for a few years, but today things are different. My six-foot tall junior in high school still has to let me drive him to school due to the lack of his car ownership, however he pops out of the car as soon as traffic slows, and today there is no looking back at mommy... no tears in his lake blue eyes. But there were tears in mine. I know my time is coming close. I know that two years from now I will also be dropping him off at school, but that day he won't be coming home when the school day is done. Hopefully he'll home for Christmas break, but I know the man who comes home will be different from the man I drop off. And while I'm so very proud of that person he is becoming, I also know I will forever miss that little boy who ran into my arms and missed me. 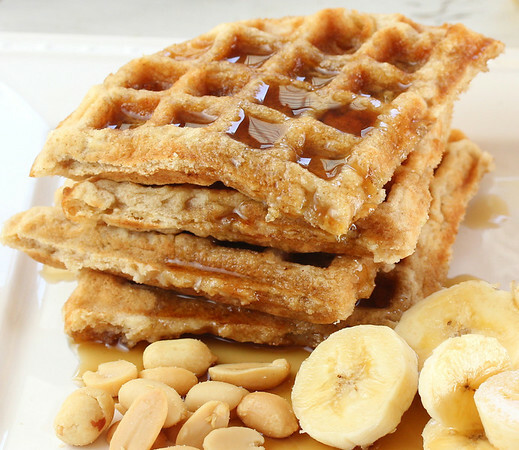 But for today, there were waffles. My waffles, and he liked them. He even said thanks, and I got an ever so quick pat on the shoulder before we headed to the car. He chatted on the ride, and I savored each and every second of our time alone in the car together. I know my husband and I have done a good job, we've prepared him for life without us and he will succeed. He is confident, bright and eager to grow. He will go out into the world and I will become more of an afterthought... as it should be. But he will miss my waffles. "Peanut Butter Granola... what do you think??" That was the message I sent to one of Liv's dance friends a week or two ago, and almost immediately I received a response in all caps, "I THINK YES!". 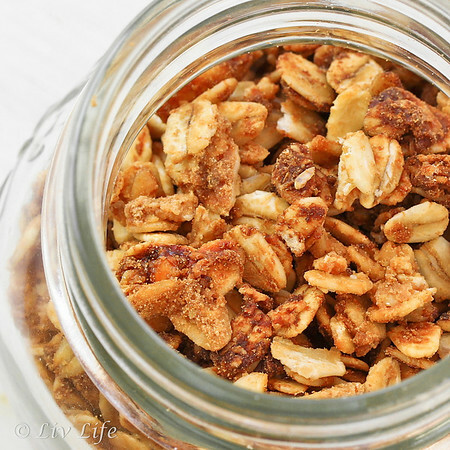 Ellie, one of the girls in our dance carpool last year, discovered she does indeed love granola, and became one of my main taste testers as we set about creating our own granola recipes. 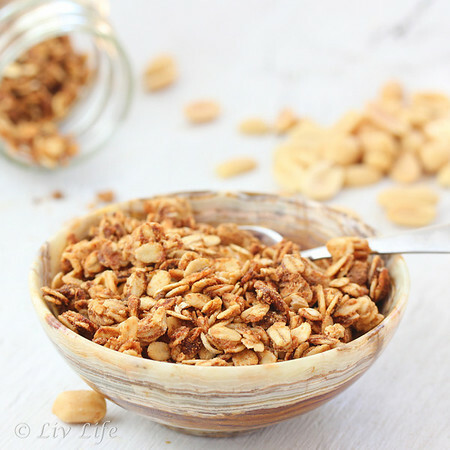 Trying to bring the girls healthy snacks between school and dance rehearsals, I didn't think granola would fly, but the sweetened, crunchy goodness became a favored treat. While our opinions varied on the correct amount of sweetness, we all came to look forward to a little bag of granola in the car. 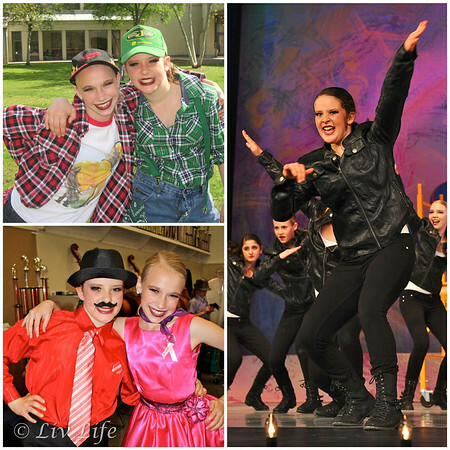 Ellie and Liv are frequently matched up as dance partners, and have danced as everything from hillbillies, baseball players to the characters from West Side Story. Right - Ellie hip hops her way to Nationals. Usually filled with a base of rolled oats, we've added everything from dried mangoes and macadamia nuts, raisins and pepitas, slivered almonds and apricots, and beyond. Usually the mixture benefited from the sweet addition (the fruits) and some sort of salty addition (the nuts and seeds) to bring depth. 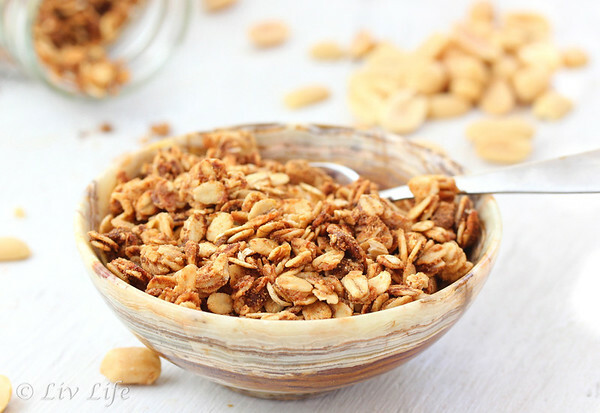 But this Peanut Butter Granola... well, this one can stand alone. Simply filled with oats, flax, peanut butter, brown sugar, vanilla and an egg white, the mixture still meets my approval for a healthy snack, but the with no added fruits for sweetness, the amount of sugar for the girl's taste for sweetness goes a bit above my happy point. None-the-less, with the delicate peanut buttery goodness, I too found the granola to be nearly irresistible. As Ellie's birthday happened to coincide with our granola prep, she became the happy recipient of a freshly prepared jar of Peanut Butter Granola. How many teenagers do you know whose eyes light up at the sight of sweetened oats?? 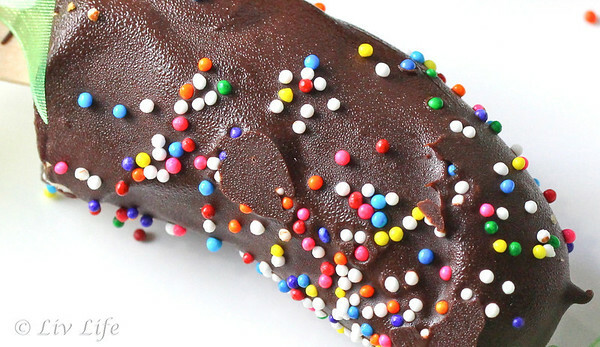 I've had people laugh out loud when I mention how difficult I find food photography. "Really? ", they ask, "How hard can it be? It's just food after all, you snap a pic and there you have it. It's not like trying to get a baby to smile or anything...". Yes... really. I find it extraordinarily difficult. Hence, when local photographer, Laurie of Dalla Mia Cucina, asked me to join her Food Photography and Styling Group, I hesitated. Join a group of women where some of them list photography as their career? I felt in no way qualified. The group however, has turned out to be one of the most supportive groups of women I "know". You see we are a group of women from around the world, and while our main focus has been photography, we have become virtual friends across the internet through our various projects and chats. Frequently I find myself in a conversation with my husband or local girlfriends and I will mention, "Well... one of the ladies in my photography group said...". They are becoming a constant and welcomed part of my life, and I miss them when time is too short to chat and catch up on our lives. These extraordinarily talented women have also helped me to grow. The monthly challenges have stretched my abilities, and while I've not risen to every occasion, some of my challenges have been quite satisfying. I am still very much struggling with styling, and as such I find myself shooting close ups of food, hence, not much styling required. Viewing their setups though, and taking the time to take apart their photos along with their advice on colors, spacing, textures, lighting, etc, I've learned a trick or two along the way, and I'm becoming ever so slightly more comfortable styling my shots. The challenge presented this month is titled Summer Desserts. As we mentioned in our last post, here in coastal San Diego we are holding onto and savoring each and every sunny/hot day. Locally, our June and early July often lend a dreadful marine layer, a sort of fog aptly named the June Gloom, that hangs over our homes for weeks on end making me ever so jealous as I read about the rest of the country enjoying summer. With stories of melting ice cream by the lake, popsicles on the front lawn while taking a break from running through the sprinklers, we sit here in our sweatshirts and long pants longing to join you all. With our 2012 August bringing more traditional "summer" weather, Liv and I were perfectly in the mood to work on this challenge. 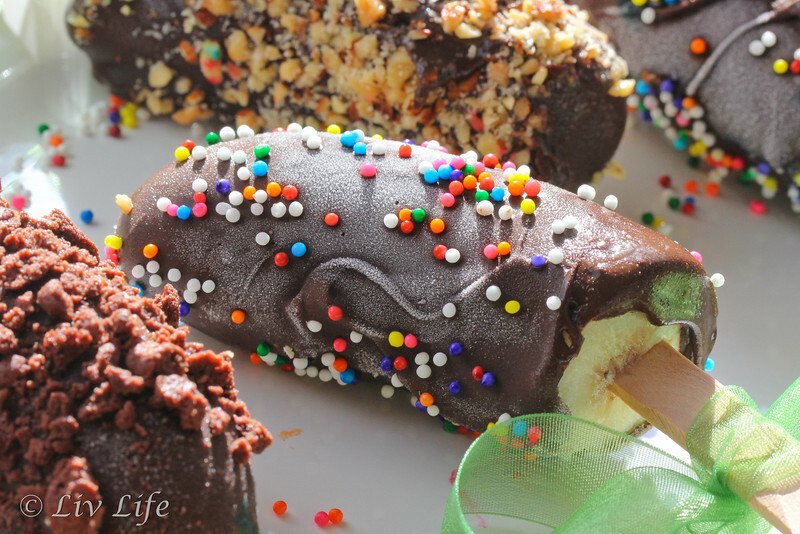 The popsicles from our last post were our first attempt, and while they didn't make the cut, they did cool us off. Ice cream was suggested, but the lack for a frozen ice cream bowl sent us searching for a different avenue. Liv and her love of bananas spied Trader Joe's chocolate dipped banana chunks, and she immediately told me she was sure we could do them better. And better we did. 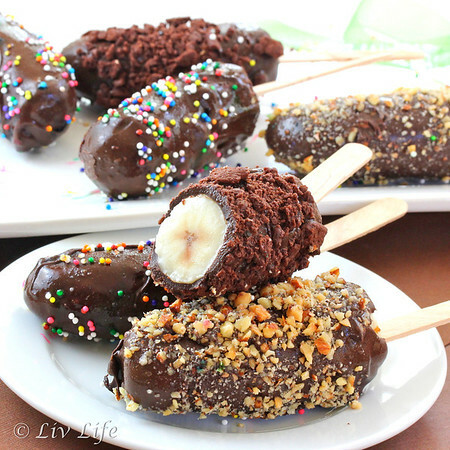 Spreading an array of toppings, Liv set to chopping the chocolate as I froze the bananas on sticks. 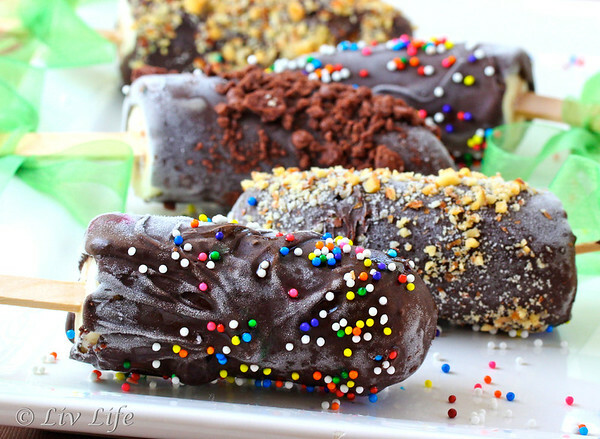 Freezing the bananas makes easy work of dipping the fruits as the chocolate clings and chills quickly. A quick dip in the chocolate followed by a dip into a topping, and the treats were ready for a brief chill back in the freezer. Next came our photo shoot. The first difficulty I encountered was condensation. Is condensation good in a photo? Thinking it through, I liked the look it gave, sort of the impression of a hot summer day, however the little droplets didn't always photograph in an appealing manner. As our temps were into the mid 80's that day, and we do not have air conditioning, the chocolate softened quickly, taking away the droplets and lending a nice sheen and a deep, rich chocolaty coating. Problem solved. While my satisfaction was still not complete, Liv's patience began to wear thin. She's all about the prepping and eating of the recipe, however a photo shoot lasting longer than 10 minute is really not her thing. Grabbing one of our not-so-pretty bananas, she took a few bites, appeared to be lost in thought for a moment, then jumped up with an exclamation of "I have it"! Pulling a fresh plate from the cupboard, she quickly set to arranging bananas along with a half eaten banana to show what was on the inside, giving more depth to the shot. I have to admit her idea was brilliant, and within minutes we had images that made us happy. Still preferring the close up the best, we set to shooting the arrangement at differing angles and heights, definitely preferring some versions far more than others. Shot with my favored Canon 60mm macro lens, the morning summer light streaming into our windows lent a fresh, bright atmosphere to the shots, and a little fill light from my trusty Lowell Ego Light took away the remaining shadows. Alternatively, loving the look of the bananas directly in the morning sun, I found capturing that image to be more than difficult, bringing somewhat washed out colors and none of the richness that my eye picked up. 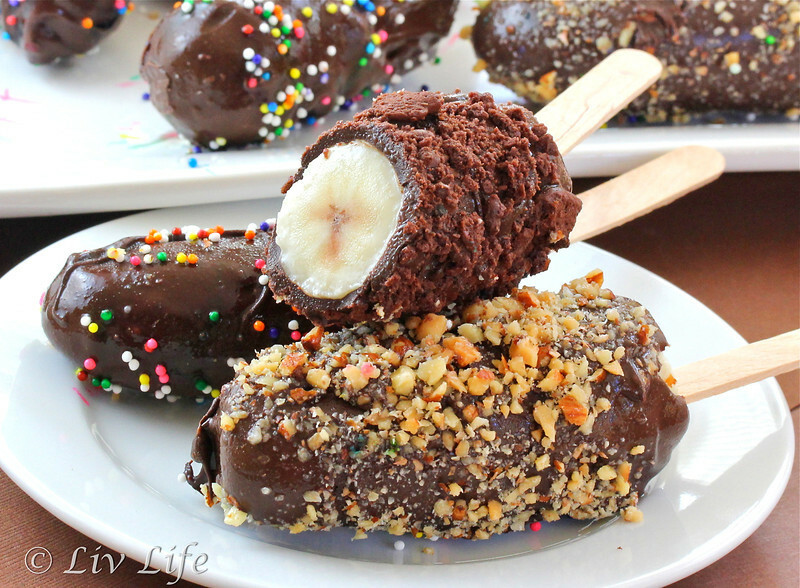 Summer on a stick, Liv gave the bananas two thumbs up, and since our original photo, we have dipped dozens of bananas with all sorts of different toppings. 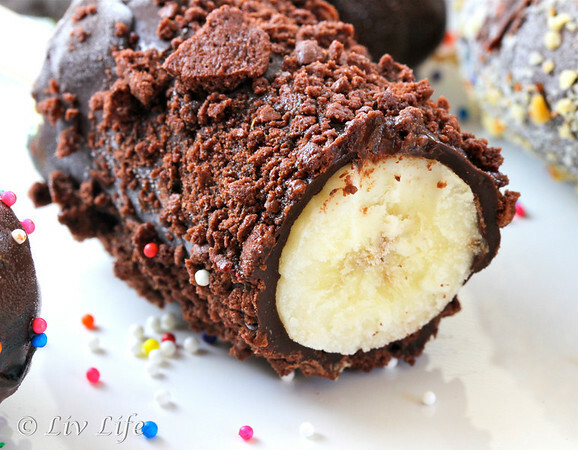 Sprinkles, cereals, nuts, and crushed cookies, have your kids pick their favorites, you simply can't go wrong. While the rest of the blogosphere seems to be turning its back on summer and instead diving head first into fall, here in San Diego we are still in full summer ahead mode. As much of our June and early July on the coast consists of a deep marine layer which on occasion can last for weeks, we savor each and every moment of our long awaited sunny summer days, and these last few summer weeks have been extraordinary. Waking to full sun with no jacket required, I've spent my mornings on the patio with my cup of coffee. 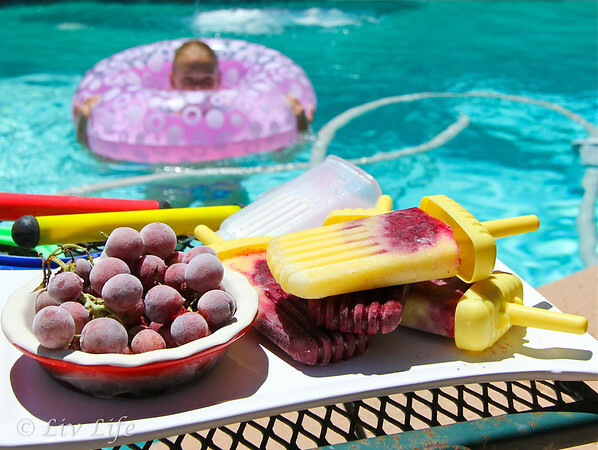 The afternoon temps have reached my beloved 90º point, and have had Liv and her friends enjoying the pool, bringing us the perfect venue for a version of Coastal Living's Frozen Blueberry Pineapple Pops. 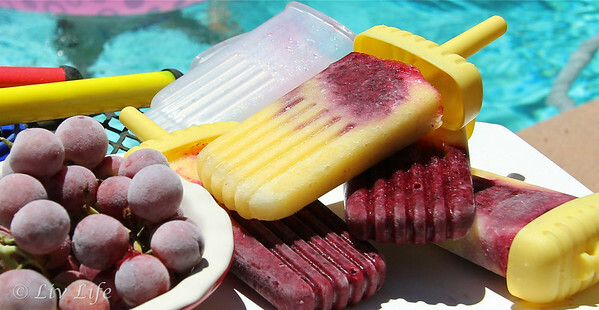 Taking mere minutes to put together and requiring a couple of hours to freeze, these fresh fruit pops are perfect for cooling off on a hot day. Telling the girls I had "fresh fruit popsicles" or "sweet juice popsicles", they immediately chose the "sweet juice pops". Little did they know, I only had one set of frozen treats, and whatever answer they gave they were receiving the fresh fruit version. Gushing over how they had chosen correctly, the girls floated on their rings while nibbling on the pops and another summer favorite, frozen grapes and mentioned how cool Liv's mom was to not make them eat the fruit pops. Shhhhh.... don't tell them that they had a healthier snack than they thought. 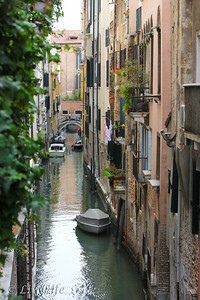 Ahhh, Venezia... timeless and stunningly beautiful, at each turn she becomes a photographer's dream. 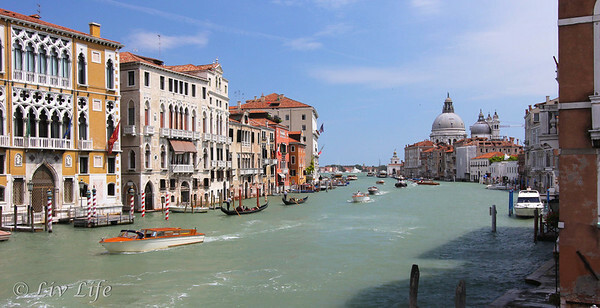 With multitudes of watery canals and winding alleyways, Venice provides a mosaic of color, texture and pure brilliance in addition to traditional history, architecture, and art. 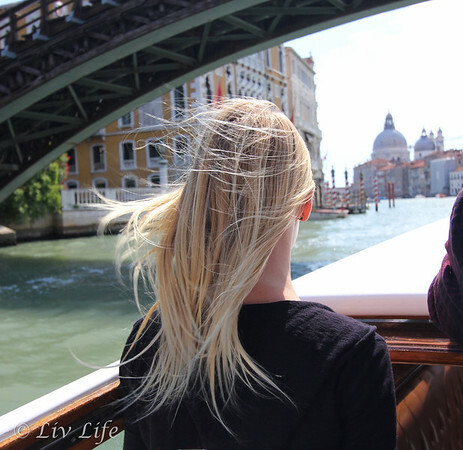 The first stop on our summer 2012 vacation, Liv Life and Family arrived to the Grand Canal by water taxi, all four of us gushing at the sheer beauty of the city. Traveling down the bustling thoroughfare, we had not doubt that we were no longer in San Diego. 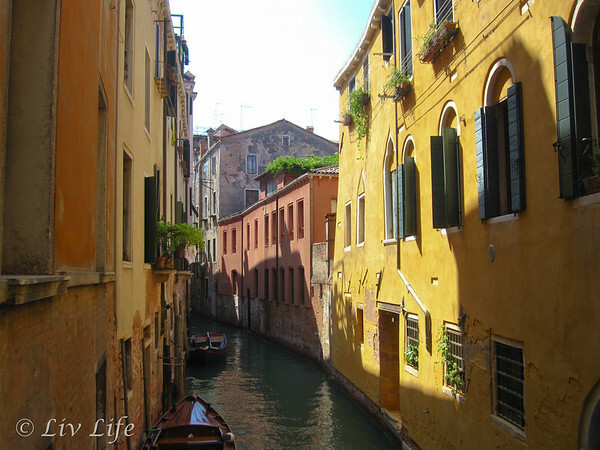 In my research for our vacation, I found myself craving photos of Venice along with trip reviews outlining what others had done during their own stays in this Jewel of the Adriatic. The stunning photos I stumbled across only served to grow my excitement, while tips regarding water taxis, churches, architecture, gondolas, costs of tours, worthiness of tours, Vaporettos, etc., etc., etc., helped me to plan my own trip. Tailoring my days in Venice to suit my tastes, I'm ever so thankful to those who took the time to post their own thoughts and tips along the way. 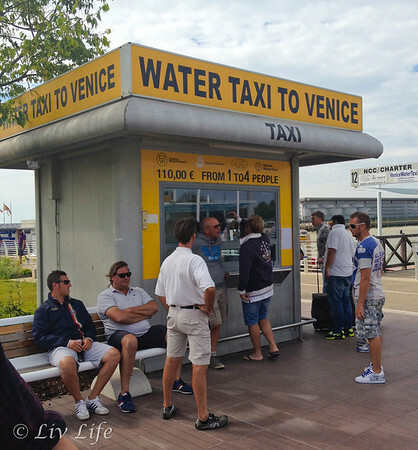 First of all, I can't say enough how much we enjoyed and appreciated our arrival to Venice by water taxi. Arriving mid morning at Marco Polo airport, the water taxi was easy enough to find - turn left outside of the terminal and follow the signs - and once on the path to the water taxi departure area, one has about a 5 minute walk. Note that walking with heavy luggage could be a bit challenging, and I found myself more thankful than ever for my rolling suitcase. Once arriving at this stand we found a man with a clipboard and he coordinated with one of the drivers to take us to our hotel by way of the Grand Canal. 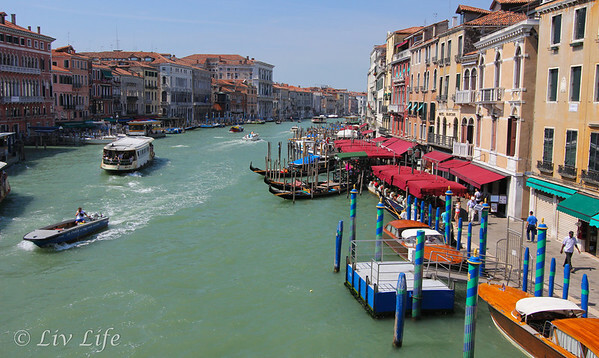 The cost to go directly to the hotel was quoted at €110, an additional €50 was charged to take the canal route. 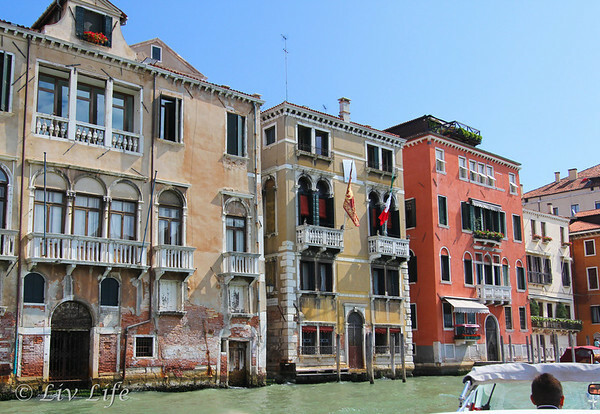 With our limited time in Venice, this was indeed the way to go as the taxi not only provided easy and personal transportation, but a tour of the canal. Watching the kid's eyes as we entered the canal, viewing the real Venice for the first time, is a memory I will carry with me forever. Knowing the ease of the water taxi, our hotel arrangements became even more attractive as we learned of the ability to step off of the taxi and into the hotel (i.e. no schlepping your cases over footbridges, etc). 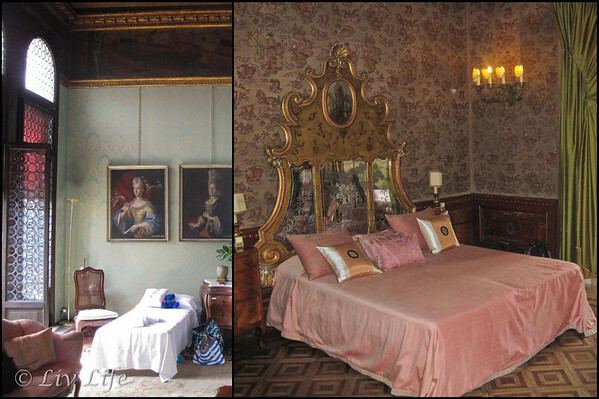 The historical Palazzo Pisani, overlooking the Grand Canal, provided a delightful stay for our overnight in Venice. Time and again my research highlighted how Venice is an attraction in and of itself. I too, found this to be indeed true, and took great pleasure in simply walking the alleys and stumbling upon hidden treasures, shops or gelaterias. 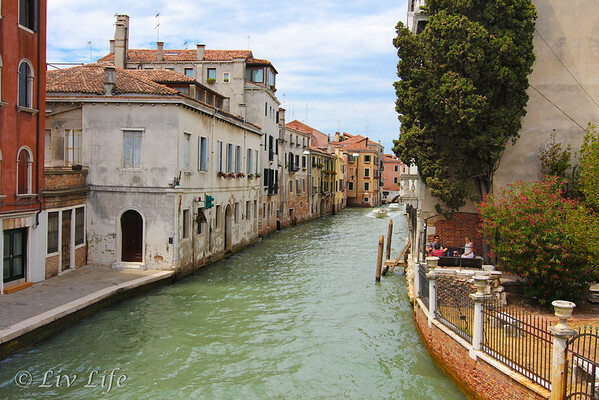 Yes, you will get lost in Venice, but that in itself is indeed indeed a treat! A good map helps to gain perspective (and ease frustration), but streets are not always well marked and as such, sticking with the direction of main landmarks, such as one of the major bridges or a major church, is helpful. 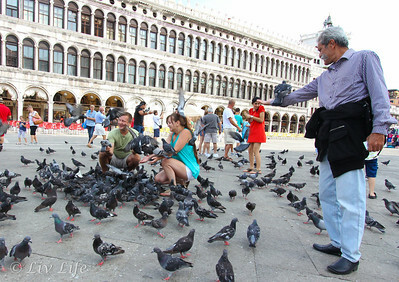 St. Mark's Square remains a major destination for most Venetian visitors. Know that since it is such a main attraction, crowds of tourists may jam the square at peak times during the day, especially during summer and as cruise ship passengers visit during their docking hours. Most of my research advised to visit the Square either early, or late, and indeed my earlier morning visit proved to be far more pleasurable than my ultra crowded mid-afternoon visit. With attractions such as the beautiful St. Mark's Basilica and Doge's Palace in addition to St. Mark's Campanile, one could feasibly spend hours in the stunning square and still not see it all. Add in time for gelato, shopping, feeding the pigeons, or an evening taste of prosecco whilst listening to the dueling orchestras, and one has a very full day. Booking our tickets ahead of time directly through the Palazzo Ducale website over 3 weeks in advance, our midsummer tickets were the last available for the day we desired. As such, booking as early as possible, especially in summer, is highly recommended. I did find numerous sites available for booking the tours, but also found numerous prices for tickets as some of the sites charged extra booking fees. Hence, we chose to book directly through the Palace website. Note that no backpacks or large bags are allowed into the Palace, and for most of the tour, photography is also not allowed. Note also that I did carry a medium size shoulder bag and had my camera slung over my shoulder for the entire tour with no issues. 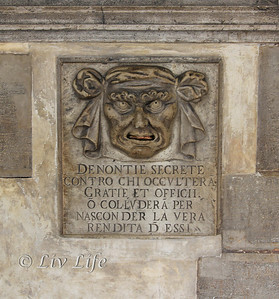 Within Doge's Palace (Venice, Italy) courtyard, these "mail slots", shaped at lion's heads, can be seen. In ancient Venice, one could slip a paper into the Lion's mouth to anonymously report the crime of a neighbor. Careful though, if you falsely accuse another you will suffer the punishment of the crime reported. Would you report your neighbor?? Attached to the Palace, one finds the infamous Bridge of Sighs. 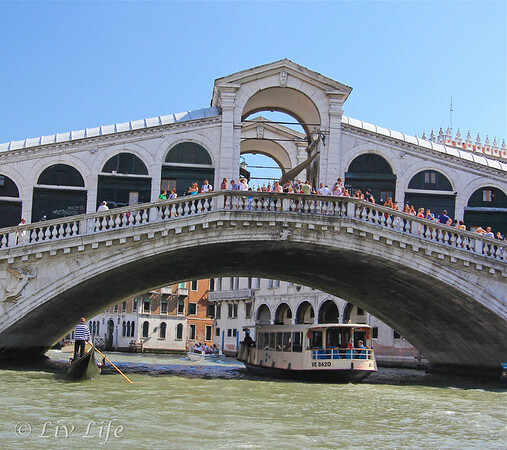 Made of sparkling white limestone, the bridge passes over the Rio di Palazzo and connects the prison with the interrogation rooms of Doge's Palace. 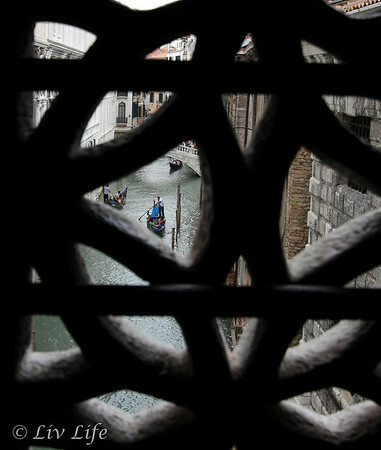 The view from the bridge became the last view of Venice that convicted prisoners would see as they were led to their cells, and legend has it that prisoners would sigh while passing over the bridge. Hence... the Bridge of Sighs. 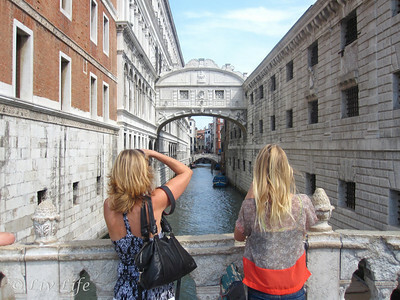 Our Secret Itinerary tour had us travel the same path as the prisoners and see for ourselves the view from the Bridge of Sighs. Heading back out into Venice, getting away from St. Marks will often lead you to less crowded areas, and our day had us heading back across the Accademia Bridge. With a bit of time to spare in addition to my Farmer's Market obsession, I couldn't help but visit the Rialto Bridge Market. Brilliant vegetables, fragrant melons, and mounds of sun dried tomatoes in addition to just about any vegetable you can think of, beckoned to me, and it took every bit of willpower I had to resist filling up a bag. 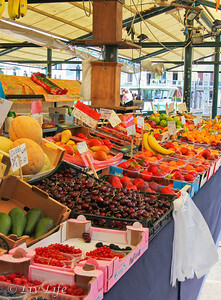 With no kitchen though, my shopping was done through my lens, and while the photos did bring the market back home, they are missing the abundant aromas of fresh produce that just can't be captured. 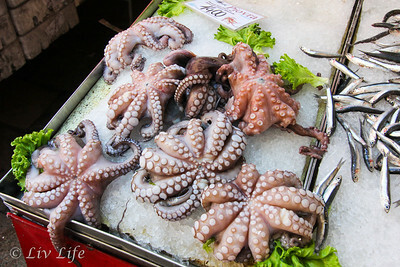 With the addition of the extensive fish market, the Rialto Market becomes one stop shopping. Featuring big fish, little fish, shelled fish, and unshelled fish, the market brimmed with choices and freshness. While the produce and fish themselves provided endless enjoyment, it was the people of the market who made my visit even more special. Haggling is not something I'm familiar with, but the enthusiasm with which these shoppers bargained with the sellers, all followed by comments checking on grandma's health, held me entranced. The last stop for our day was the majestic Santa Maria Gloriosa dei Frari, or easier i Frari. Known as a minor basilica, the church stands on the Campo dei Frari in the San Polo district. Granted the land to build on in 1250, the Franciscans completed the magnificent structure in 1338, with the campanile (bell tower), the second tallest in Venice, completed in 1396. Housing numerous excellent examples of Renaissance art, the austere church drew oohs and ahhs from my teenage children. Their first visit to a major European church, so historical and different from home, has remained with them and both have spent time reading about the history of the churches of Venice and reveling in the fact that they actually visited a few. Note, again no photography allowed inside the church. Tempted as I was to snap a photo or two on my cell phone, my photo-guards (kids) literally slapped my hand with a stern "No!". As such... no photos of the Frari Church. With our day in Venice drawing to a close, we made our way back into the alleys of the city. Passing over footbridges, through back alleys and past even more winding canals and gondolas, Venice remains a vibrant memory with visions tempting us to return. Timeless, magical, historical, and on the proper occasion, positively romantic. With miles of winding canals, multitudes of bridges and even more back alleys in which to lose yourself, Venice is indeed the secret ingredient dreams are made of. Leaving San Diego early on the morning of Liv's birthday, some 16+ hours later our Boeing 767 touched gracefully down in a different world at Venice's Marco Polo airport. Stretching our cramped limbs and attempting to brush the sleepiness from our bodies, we collected the over-packed luggage and our tired group made way for the water taxi stand. Boarding the sleek water taxi, our hearts began to fly as adrenaline woke our jet lagged minds like triple espressos on a tired morning. Within no time, the four of us were standing at the back of the taxi in pure awe of the majesty of Venice's Grand Canal. 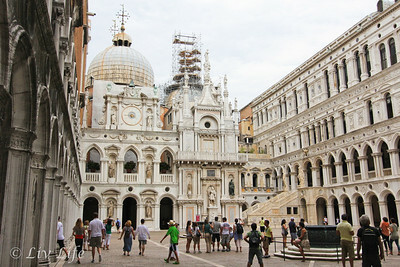 Nearly like something out of Disney's Epcot Center or the Las Vegas Venetian, Venice almost didn't seem real. Vaporettos passed filled with camera toting tourists, restaurants bordering the canal found couples enjoying late morning pastries and espressos, gondoliers tidied their gondolas for a days work, and water taxis zipped skillfully in between it all. 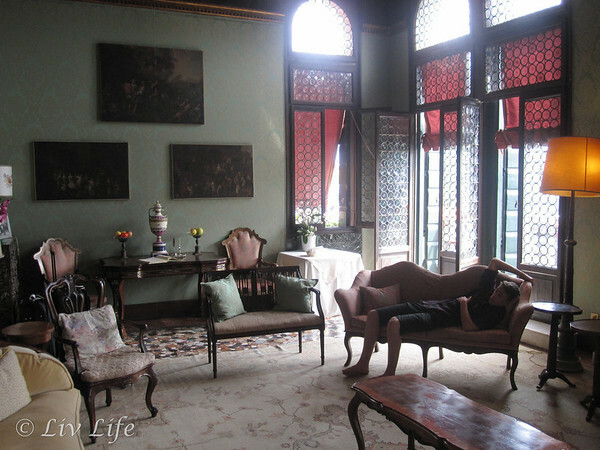 In my research for our time in Venice I remember a tidbit regarding the homes, or palaces in particular, of the city. Apparently the rule was to build like your neighbor, but no better than your neighbor. 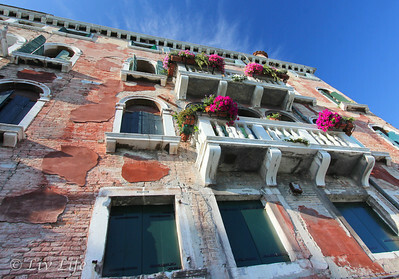 As such, much of Venice resembles the rest of Venice, bringing a beautiful mosaic of color, sculptures, columns and flower box lined windows to life. In essence, pure magic. Passing under the Accademia Bridge, or Ponte dell'Accademia, our taxi suddenly veered left, slowed and entered a small canal. Stopping just meters beyond the canal entrance, a foot bridge appeared and was lowered, a hand extended and after a few steps I found myself standing in history. The Palazzo Pisani, my home for the next 24 hours, remains more than a boutique hotel along the Grand Canal. 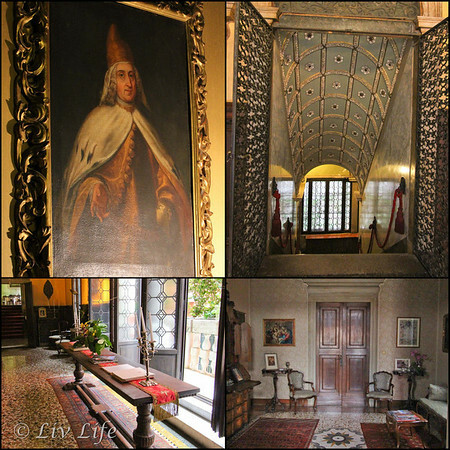 With history dating back hundreds of years, the Palazzo at one time belonged to the family of the 114th Doge of Venice, Alvise Pisani. 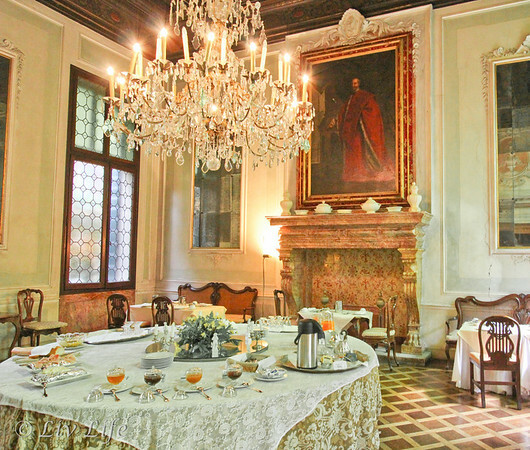 Stepping into rooms lined with paintings and frescoes depicting the history of the Palazzo and Venice itself, the architecture is simply breathtaking with detail. Mirrors lining our bedroom were said to be original, and I'm guessing date back to the 18th century when the Palazzo "added on" after purchasing the building fronting the Grand Canal. Looking up, Liv exclaimed in wonder while gazing at the detail of the ceilings, and again as she found a secret door, which just happened to lead to our bathroom. 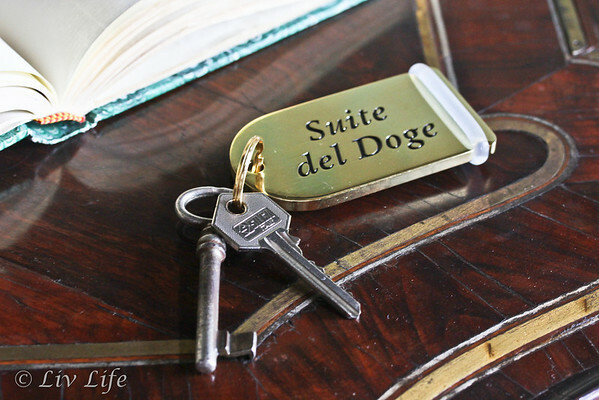 Staying in the Doge Suite, our family was treated to a majestic sitting room complete with floor to ceiling windows opening to balconies overlooking the Grand Canal below. A separate bedroom, where it has been said the likes of Bill Gates have stayed, and a hidden, modern bathroom completed our suite of rooms giving us a taste of old Venice. Liv later mentioned that she had fallen asleep that evening wondering who else may have enjoyed these rooms over the last few hundred years. Greeted as welcomed guests, Nicolo provided a tour of the Palazzo public rooms while giving a running commentary on the history of the building. His pride in Venice and Venitian history shines in his face as fact after fact slips from his tongue, and the Palazzo seems to come alive. 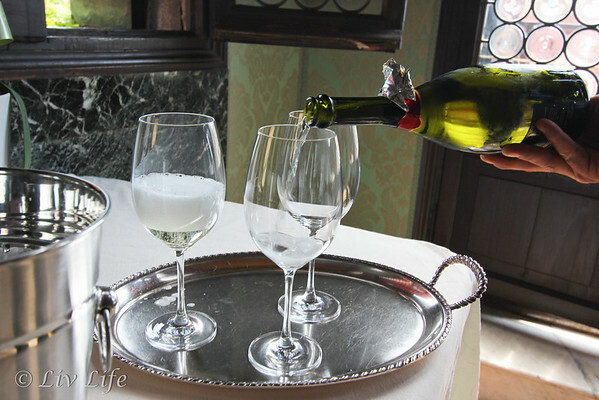 Bringing us back to our room he smiled and offered, "How about a taste of Prosecco? ", to which my husband and I responded, "That would be lovely!". Toasting the beginning our our trip, our sleepy family smiled and headed to the balconies overlooking the Grand Canal to spend some time taking in the Venetian magic. As the afternoon sun began its descent, so did the kid's eyelids, and it wasn't long before I was awake alone. Checking email, my mind drifted, and soon a distant voice reached through our open windows. Notes of deep baritone drifted over the canal and drew me once again out onto the balcony where the magic continued. Groups of gondolas made their way leisurely up the canal for a view of the Accademia Bridge, and then turned, as if in formation, right in front of my balcony. With the last sips of Prosecco in my glass, I smiled for the cameras as the gondola riders snapped their pics, and raised my glass to the magic that is Venezia. Rising early, our bodies attempted to adjust to a new time zone, and we found ourselves the first to arrive in the Grand Lounge that is now the dining room where breakfast at the Palazzo is no stingy affair. Small dining tables set with silver and linens surround a large main table laden with treats. Liv's eye immediately spotted the trays of filled croissants and pastries, while my son quickly headed for the breads, meats and cheeses. Bowls of fresh fruit along with cereals and an array juices rounded out the prepared offerings, and within moments, the beautiful Fatima, an employee who actually worked for the last remaining member of the Pisani Family, arrived to take orders of coffees, teas and cooked to order eggs. 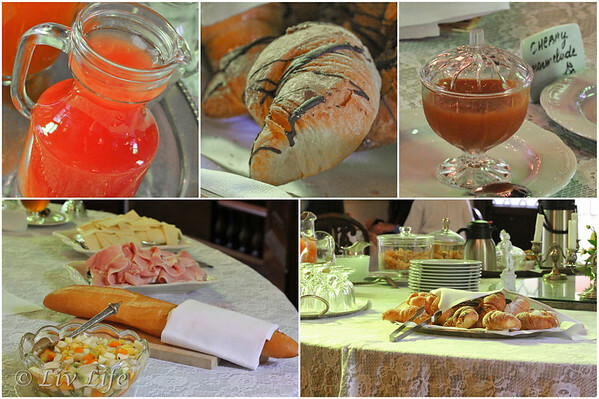 Fueled by the fabulous Palazzo breakfast and an espresso or two, the Jewel of the Adriatic awaited. 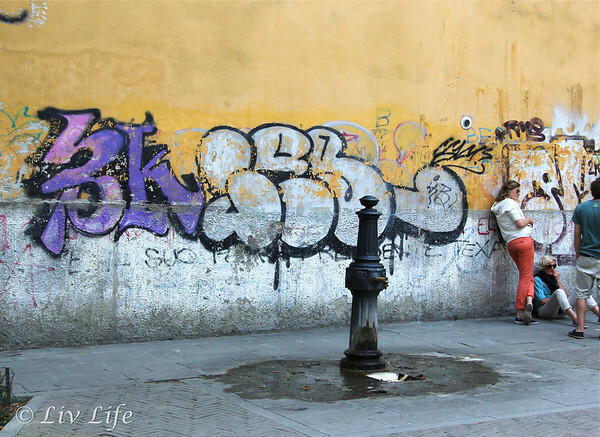 Walking shoes on, cameras in hand, we pocketed our old fashioned key and headed out to begin our own Venetian adventure. Vacation... we wait so long for it to get here. We plan, we shop, we pack. Then in just the blink of an eye we find ourselves back at the computer with memory cards full of photos and our minds full of memories. 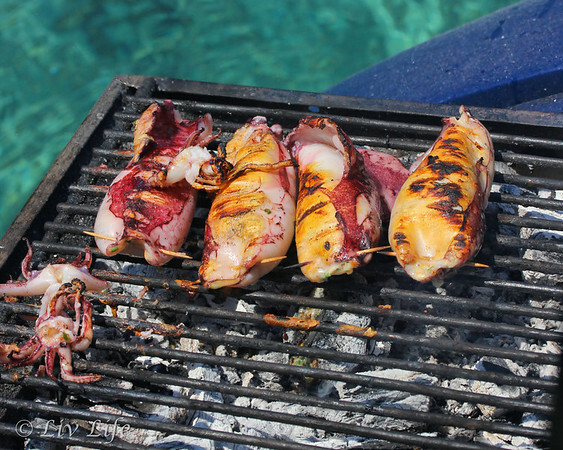 Only days back from our Adriatic adventure, my entire family has found our thoughts often drifting back to our vacation as we randomly drop comments about a memorable day or event, a funny conversation with a new friend, or a fabulous new found food. 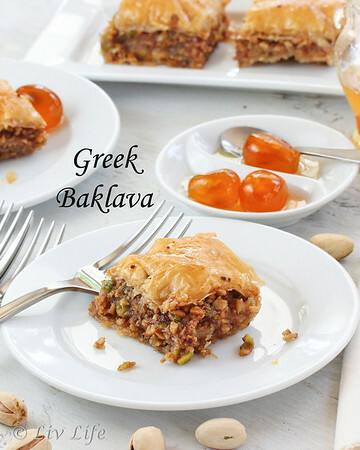 Liv's thoughts have returned time and again to a sticky piece of sweet Baklava served to us by our new Greek friend, Iakis, on his boat the Nautilus. Our day in Greece remains incredibly memorable as we discovered a new land filled with a happy hospitality and a verve for life that is remarkably contagious. Arriving in port, we spent much of our day on the Nautilus cruising the Corfu coastline and swimming in the crystal turquoise waters of the Ionian Sea. Iakis, the boat's Captain, smiled from his heart as he welcomed us onboard, and his generosity never dimmed throughout the day. 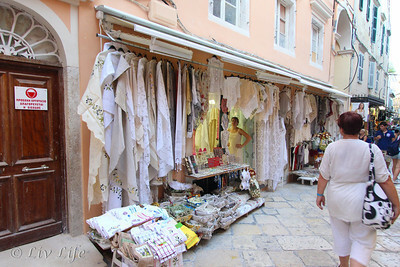 Touring Corfu after our day on the boat, warm smiles followed us from shop to shop as we purchased trinkets for home. 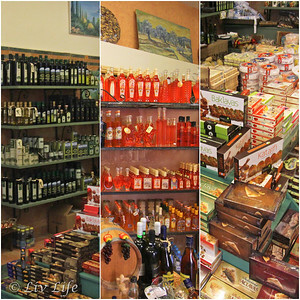 The clerk in the first souvenir shop eagerly provided sample after sample of olive oils, kumquat liquors and citrusy lotions, all the while sharing bits and pieces of his life on the island of Corfu. Leaving the shop he didn't just shake hands, but gave quick hugs with "nice to meet you" sentiments that go far beyond someone simply wishing to sell their wares. The next stop had us visiting an olive wood shop lined with walls filled with every sort of wood item you can think of. Vases, jewelery boxes, figurines, salt and pepper mills, etc. etc. etc. While the shop itself was fun to browse, it was the shop owner/clerk who made my visit particularly special. Approaching us with a welcoming smile she proceeded to help me choose various items, but never pressured me to buy a thing. Laughter was commonplace and we enjoyed learning about her life on Corfu. After I had made my choices I asked if she would mind if I took a photo. I had meant of her wares, but she immediately struck a pose and said "Sure!! Just like Cindy Crawford!" Turns out to be a fabulous photo, and yes... eat your heart out Ms Crawford. Taking a quick tour of the workshop behind the store, Ms. Sagidadinos gave me a brief history of her husband and his apprenticeship beginning at the age of 10 years-old. Definitely a stop (and a shop) I will remember forever. 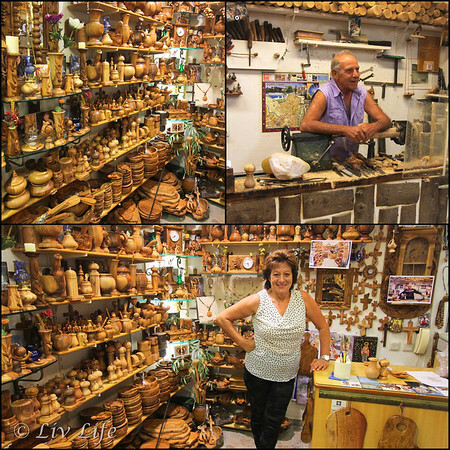 Keep an eye out for The Olive Wood Shop on Filellinon Str. if you are ever in Corfu Town, and give Mrs. Sagidadinos my best. Again, parting with hugs and cheek kisses, we were on our way. The last stop found us in a quiet little patisserie on the hunt for Liv's new found love - Baklava. Greeted by teen clerks with more welcoming smiles, we soon had a to-go package of sweet treats for my girl and our day in Corfu Town came to a close. Now home, our memories of Corfu Town, Greek hospitality and Baklava remain forefront in our minds. I came away with a wonderful impression of the Greek community, however I shouldn't have been surprised as one of Liv's best dance friends hails from Greece. A warm and generous family, like our new friends in Greece, their smiles rarely dim. 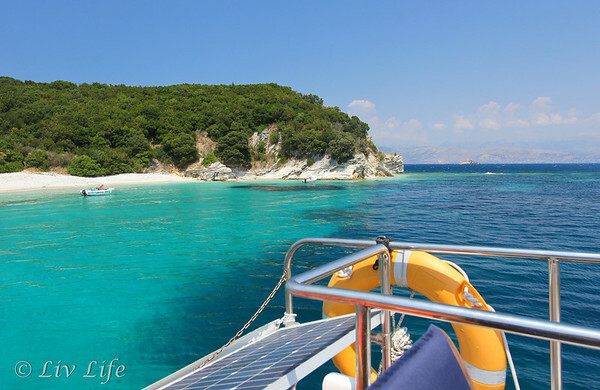 What better way to see Corfu, Greece than from the water? With land temps rising to near 100ºF and humidity to match, a day cruising the Ionian Sea on a the 12 metre yacht, Nautilus, is the way to go. Add in an abundance of traditional Greek food, generous Greek hospitality and an attempt (on my part) at Greek dancing, and one has a day that will not soon be forgotten. The second stop on our July 2012 Seabourn Venice and Adriatic Gems Cruise, had us pulling into the Kerkyra port in Corfu at 11 AM. Iakis and Alex, of Nautilus Daily Cruises, met us meters from port customs, ready to take us on our Greek adventure. 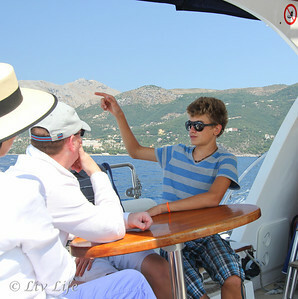 Heading back into the Ionian Sea, Iakis began our day with a leisurely tour of the local coastline while his godson, 16 year-old Alex, pointed out landmarks and points of interest along the way. Soon stopping in a little cove, the waters turned a brilliant shade of turquoise which contrasted beautifully with the deep blue of the deeper sea. Alex quickly jumped into the water while pulling the rope, and within moments Nautilus was moored and Iakis was pouring his guests a traditional Greek Ouzo to toast the beginning of our day. Heating up on the sundeck, our group of two families could no longer resist the inviting waters, and we soon found ourselves swimming with local fish through nearby caves. Paddling about for nearly half of an hour, time flew as we explored the small beaches and enjoyed the clear, refreshing waters. 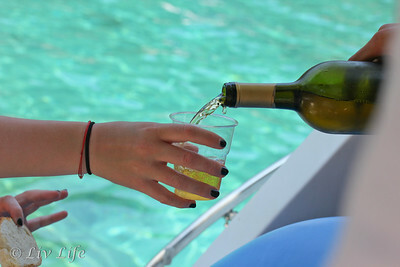 Back onboard, Iakis provided refreshments and we were soon underway cruising along more of the beautiful coastline. Stopping in various coves, Iakis and Alex gave us a running commentary of the local happenings along with descriptions and history of the buildings we passed by. Relaxation settled in, and the 8 of us sighed with pleasure and contentment as the light winds kept us cool. Mooring once again, our group found ourselves on a beach reachable only by boat. Here is where our appetites were fed. 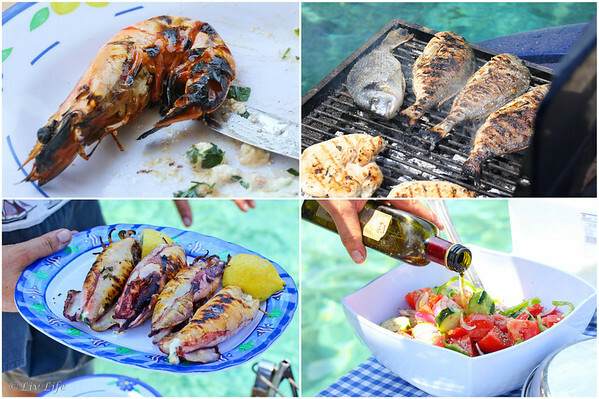 Equipped with a grill on the back of his boat, Iakis, a former chef, tempted us with Greek delights many of us had never tasted. The fire quickly lit and in no time our ultimate host had plates of Saganaki ready for us to try. A dish I've never tasted, I can honestly say this cheesy appetizer remains a highpoint of my vacation. 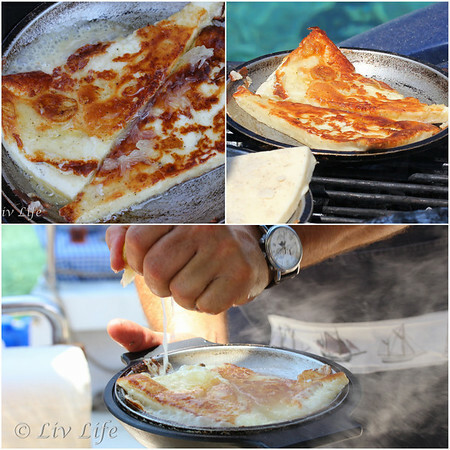 Greek Kefalotiri (cheese) is basted with milk (and eggs, so I've been told, if one wishes to make it even more tempting! ), then dredged in flour with a little black pepper. The cheese is then fried in a very hot olive oil and served quickly thereafter with fresh bread. Topped with a squeeze of fresh lemon juice, Saganaki is a little slice of Greek heaven. Next up, another cheese appetizer had pans of onions, peppers, tomatoes, garlic and olive oil topped with Feta set on the grill to simmer. Aromas of the grilling veggies and garlic had stomachs rumbling and mouths watering in anticipation. Again with the bread, this cheese dish had us gushing and reaching for more. And the food didn't stop there. Admittedly we did order extra as we had our new Scottish friends with us, but the shrimp, chicken, fish, grilled peppers, Greek salad and a delightful, creamy Tzatziki in addition to our first courses had the eight of us soon holding our bellies and proclaiming we simply couldn't eat any more. Iakis is indeed the ultimate chef. Oh! And did I mention the wine? Turns out Iakis is not only a fabulous chef, but he is also a talented wine maker. Bringing a sweet white in addition to a refreshing red, the adults of the group sipped homemade Greek wine with our phenomenal Greek delicacies while the kids and Iakis chose from an array of sodas, juice and water. Ultimately satiated and slightly sleepy from the food and wine, our group enjoyed a nice, leisurely lounge on the deck of the Nautilus, but it wasn't long before the cool, inviting waters had us back in for a quick swim. Alex joined us and Iakis tossed a few inflatable rings into the water for us to float on. What a way to spend an afternoon! Back onboard the Nautilus, Iakis asked if we would like to head back to our ship or find another swimming area? The resounding answer was another swimming area! Cruising us back up the coast he pulled into another beautiful cove as the kids quickly spied some rocky cliffs to jump from. Scrambling up the cliffs, the kids and dads took turn after turn jumping off of what seemed to be 20 stories from the top, but was maybe (not quite...) 20 feet in reality. Alex and Liv did a tandem jump and she screamed with laugher all the way down. Slightly sunburned, ultimately satiated, and completely relaxed, our group finally made its way back to the Corfu port. Over the next few days our families would meet for dinner while enjoying the rest of our Seabourn Cruise, and more often than not, our conversation returned to Iakis, Alex, our day on the Nautilus and the fabulous Saganaki in addition to the other wonderful food. Thank you, Iakis for a fabulous day! 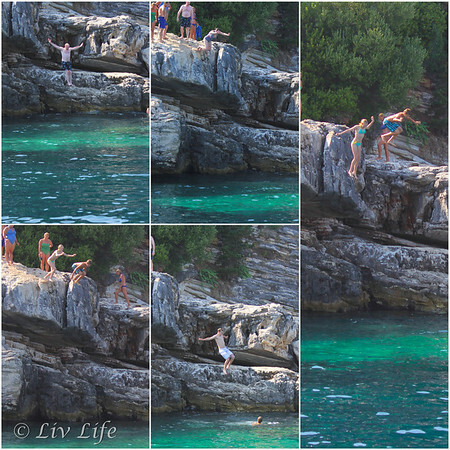 Liv has already requested that our next vacation please include another day in Corfu. Scotland, Greece & the USA come together - Living Life in Corfu! Pax Organic Teethers - A natural choice for your baby! Copyright © Liv Life 2017. All rights reserved. Simple theme. Powered by Blogger.